Enjoy your time away knowing your pet is having fun with furry friends. Contact Camp Bow Wow Pittsburgh Highland Park today at (412) 362-7529 to learn more. Your dog is your family – at Camp Bow Wow Pittsburgh Highland Park, we understand that. As dog lovers ourselves, we take your pup’s care very seriously. That’s why we think of ourselves as so much more than just a dog boarding service. We are here to provide love and support for your furry family member while you are away—filling that gap as best we can until your return. Price per night. Includes indoor/outdoor Daycare, live webcams, constant monitoring by our certified Camp Counselors in the play yards at a safe dog/staff ratio, play equipment, cozy cots, fleece blankets and a bed time treat! Service is charged per night. For Campers under 15 lbs staying in one of our Teacup cabins. Includes Daycare in our indoor/outdoor play yards, web cams in play yards, Camp Counselor supervision, private cabin, soft cot, fleece blanket and campfire bedtime treat. Price per night. Includes indoor/outdoor Daycare, live webcams, constant monitoring by our certified Camp Counselors in the play yards at a safe dog/staff ratio, play equipment, cozy cots, fleece blankets and a bed time treat! Family dogs must share Cabin for multi-dog pricing. Price per night. 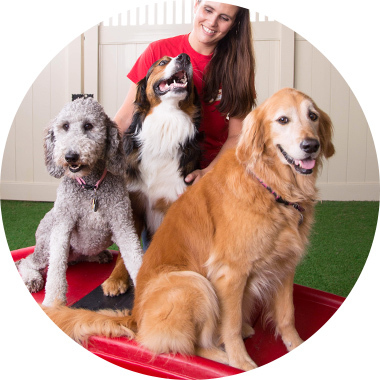 Includes indoor/outdoor Daycare, live webcams, constant monitoring by our certified Camp Counselors in the play yards at a safe dog/staff ratio, play equipment, cozy cots, fleece blankets and a bed time treat! Family dogs must share Cabins for multi-dog pricing. Luxury suites include standard boarding items but also include a large private room with a webcam and TV. Luxury Suite is an additional $20 per night above standard cabin pricing regardless of number of dogs in suite. One-on-one affection time with petting, belly rubs, story telling, and brushing. 15 minutes session.